Do you feel like it’s never enough—never enough food, never enough fun, never enough time, never enough money, never enough love, never enough happiness? It is natural for human beings to consciously search for more, more, MORE as if doing so will somehow complete us, fulfill us. Oftentimes, living a life of more, more, more can eventually feel like running on a hamster wheel. I need to have more fun, which means I need to have more money, which means I need to work more or get a second job, which means I am more tired, which means I need to drink more coffee, which means I am more hungry, which means I am more overweight, which means I need to go to the gym more…we could go on and on. If you’ve been waiting to hear this, allow me to assist you. Where is this getting you? 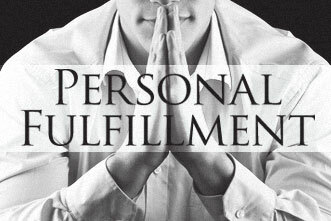 Are you really feeling fulfilled? To achieve organic self- fulfillment, fulfillment from the inside (with peace, love, and faith) instead of from the outside (with cars, houses, food, alcohol, coffee, drugs, etc. ), there are actions that can be taken, and it starts with getting to know the TRUE YOU! Realize that having more food, more drugs, more space, more luxury, more ANYTHING external creates good feelings within us. It’s a rush, and many of us want more! But how can we create good feelings thatlast without having to add more? Evaluate what your values are. Knowing your values can assist you in understanding why you do what you do, and want what you want. Examine life through rose-colored glasses. Take what you normally view as negative, and put a positive spin on it. Be amazed with how open you naturally become to all situations of life. Know what kind of person you want to be. Take note of who you admire, and know that it’s because it is something you value for yourself. Take action! Either do similar things that someone you admire does or just do something that speaks to you like practicing meditation, taking a yoga class, joining a chorus, or just making more time for play and being outdoors. Are you ready to stop running in circles, and start taking powerful, peaceful strides forward? Hamster vs. peaceful warrior. The choice is yours. As always, I’m here for you! Fill out the contact form below and let’s start getting to know the beautiful, beautiful you!